With America’s most patriotic holiday right around the corner, we have come up with six easy ways to incorporate some Fourth of July spirit into your business marketing strategy. Incorporate July 4 into a blog post. No matter what type of business you’re marketing, the Fourth of July is a holiday that can easily be incorporated into your content. Gather patriotic recipes, put together festive outfits, outline some firework safety tips or pull together a fun playlist of songs. Most towns have firework displays, fairs, 5K runs and more happening around the Fourth of July. Get in on the action and sponsor a local activity or set up a booth. This gets your company’s name in the public eye at a time when a lot of people are out and about. Show your spirit on social media. 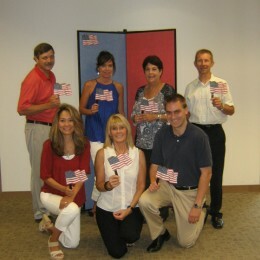 a creative photo featuring your employees, customers or product that celebrates our nation’s independence. Everyone likes free stuff, right? Look for opportunities where you can distribute red, white and blue “swag” with your company name on it. For example, join the Fourth of July parade to hand out items along the route, or run an Independence Day giveaway campaign on social media where one lucky winner receives a free service or product. If you have the capability and capacity, consider hosting an event. If you’re a restaurant, offer a discount to patrons wearing red, white and blue. If you’re a church, host an afternoon outdoor picnic. If you’re a business with a storefront, hire a band to play patriotic music outside your store entrance. The possibilities are endless. Did you know that all of Screenflex’s portable room divider products are manufactured in the U.S.? We’re proud of that! Maybe your product is made in the U.S. as well, or a portion of your profit is donated to a charity organization benefitting veterans. These are great qualities to publicize, as they tend to be key factors in driving consumers’ emotional engagement with your brand. So, now that you’ve got some ideas, don’t miss out on a great opportunity to further develop your business through strategic marketing this July. Oh, and don’t forget to watch some fireworks, be with family and light some sparklers. Happy Independence Day!